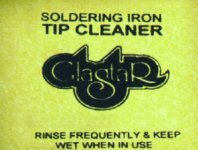 The Glastar Iron Controller works like a kiln "infinite switch", cycling the power through your iron at 100% power for a certain length of time and then completely off (much like how the furnace in your house works). The other Iron Controllers operate like dimmer switches regulating the amount of current going into the iron. TEMPRIGHT CONTROL (#07539) with three prong plug and 400 watt capacity will handle just about any iron you can find! From Mika, so you know it's made well. 1 year warranty. 3 prong plug. LEPONITT PROFESSIONAL SOLDERING IRON CONTROL (#3910-P) is a quality, low cost iron control. Not at all fancy, but it will do a nice job regulating your iron. A good choice for students or studios as the price is reasonable and it has the capacity for studio work. 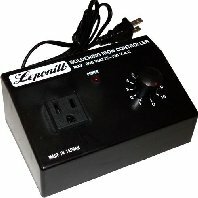 120 volts, 800 watt capacity. Three prong plug and two prong cord. 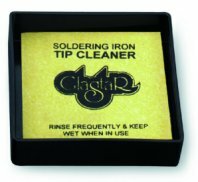 STUDIO PRO SOLDERING IRON STAND (#0753) holds your smaller irons off your table and safely out of the way. Features heavy cast base with sponge holder and spring style barrel cover. 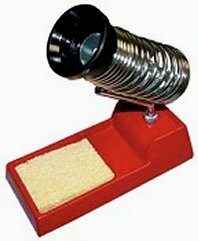 Use with irons up to 100 watts. A must for a safe work area! 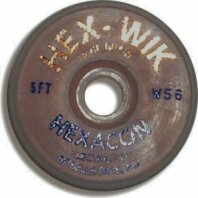 CRADLE STYLE IRON HOLDER (#0741) is the same holder as supplied with Heavy Duty Hexacon Irons. Not stylish, no sponge included, but it holds larger irons (up to 300 watts) safely. DESOLDERING WICK (#0749) is handy for repair work. Spread the braided wire slightly, lightly flux, then press between your hot iron tip and the solder you wish to remove. The copper braid wicks the solder up! 5 ft spool.